Situated adjacent to the Nocatee Splash Water Park, Crosswater Hall is an impressive gathering place for any size group. Styled in Florida classical architecture and constructed with the finest materials and craftsmanship, the facility is complimentary of Northeast Florida’s rich architectural heritage. Crosswater Hall includes the Nocatee Room banquet facility and the Seabreeze Room conference space located on its top floor. Also housed within this stylish two-story clubhouse is the Nocatee Welcome Center. 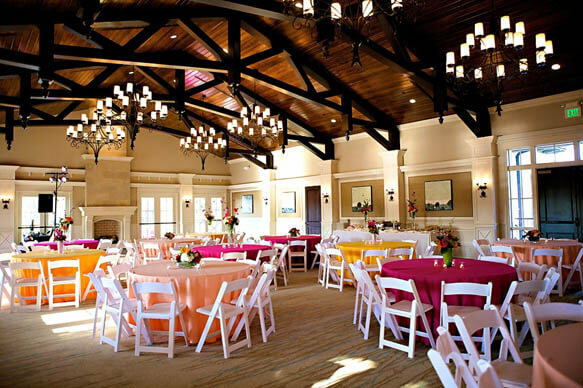 The Nocatee Room is the perfect location for weddings, corporate functions or private parties. Complete with a convenient catering kitchen, the facility includes a romantic fireplace, vaulted, wood-beam ceiling and French doors that lead to a plantation-style balcony. Guests can enjoy this spacious indoor venue as well as gather together on the primary outdoor event lawn located longside Crosswater Hall. 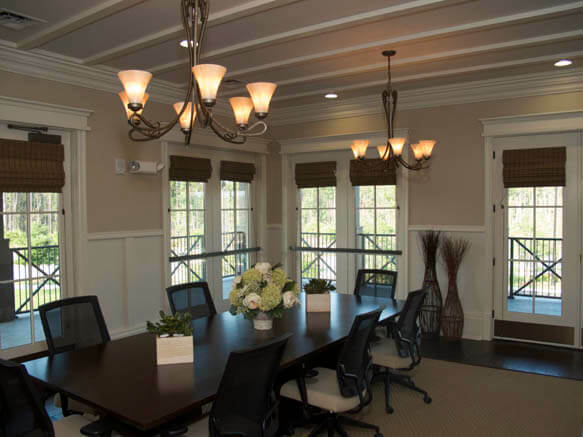 The Seabreeze Room conference space is an impressive venue for a small corporate meeting or an intimate dinner party. The room comfortably seats 8-10 , includes a private restroom, wrap-around private balcony, state-of-the-art technology with conference call capability, and high-speed internet. 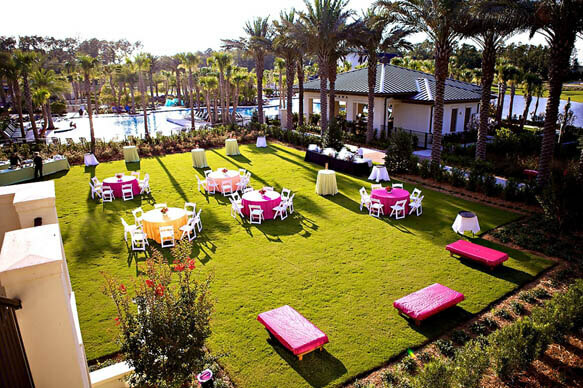 This beautiful event lawn is the perfect outdoor setting for a wedding ceremony, reception or other social gathering. With space to accommodate 200 people, the lively atmosphere is second only to the beauty of its surroundings. straight thru the roundabout, take a right into the parking lot for Splash Water Park. roundabout, take a right into the parking lot for Splash Water Park. Waterway Bridge to Nocatee Parkway. Follow Nocatee Parkway to the Crosswater Parkway exit ramp. Crosswater Hall is available for site tours Mon-Fri 9-5. Or fill out this form, and a Nocatee Representative will be in touch with you shortly. If you would like to see more pictures of Nocatee Weddings, LIKE Nocatee Crosswater Hall on Facebook.